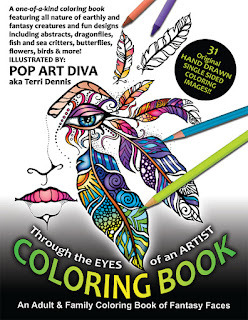 A unique, one-of-a-kind coloring book featuring women's eyes and faces morphing into all nature of earthly and fantasy creatures with coloring designs ranging from abstracts, butterflies, fish and sea critters, dragonflies, birds, flowers and even a skull and a cosmic view of space. All as seen "through the eyes" of an artist. * 15 Vertical Images and 15 Horizontal Images, PLUS the Cover Art! * There's even a little coloring doodle on the "Book Colored by" page, & you can color me on the "About the Artist" page! * Skill levels are easy to moderately detailed. * Well defined boundaries to make it easy to "color inside the lines". * Includes Coloring Tips, Coloring Medium Charts and Medium Testing Pages!